I’m still a sucker for a love story and a fan of a good ‘chick flick.” I tend to look for love in all types of people, even the grumpy ones (it’s there, you just have to dig a little deeper). I’m a hopeless romantic and can get caught up in the feel goods of life: the charming, the attraction, the too-good-to-be-true. It’s true that I will thumb through a romantic novel once or twice a year (hurriedly awaiting the climax). And yes, I’m prone to still doodle little hearts on a blank sheet of paper. I find all of this momentarily gratifying, uniquely satisfying, and an opportunity to drift away from the dog-days that always surpass summer. Here recently, however, I’ve been paying more attention to the movement in my gut. Yes, I’m aware of the importance of my brain and its value when it’s time to make a smart, sound decision about love. I’m well aware of my heart — the home of my most tender feelings and the place where many of my truths h ideout. The heart, who can blame it, can love forever, without measure, even when the love is no longer loving. It just does. But your gut may be the most telling of them all. The gut — that area nestled between your stomach and your reproductive area, just behind the abdomen — is your natural fire pit that burns when it’s right and it’s your fire alarm system when things are wrong. It immediately alerts you…to everything! It flashes signs that tell you to move closer. It screams, yells and shouts when it’s time to run for your damn life. It even acts bored and uninterested when there is actually no chemistry between you and another. Oh yeah, it’s that good. To me, the gut is the most honest instinct we have, and yet, we don’t trust it. We ignore the signs. We find ways to rationalize our choices. We counter it at every turn. It is the birthplace of our God-given intuition and the seat of our divine energy. It’s been telling me to love again, to dream bigger, to run the race. It’s been telling me to speak softer, but with more meaningful words this time around, like I love you, and it’s really over. Its annoying nudge is so persistent, it led me here, screaming, tell them, tell them everything. My gut, my beloved inner soul, like yours, wants to exist. Let it. If I had to chart my progress with love, I’d have to go back and admit, that at every crossroad, my gut was right every time. And yet, I chose the other tried and true answers of my logical brain and my overindulging heart. I betrayed the one thing that could help me make a better choice. I didn’t listen. So now, I’m choosing a different way. 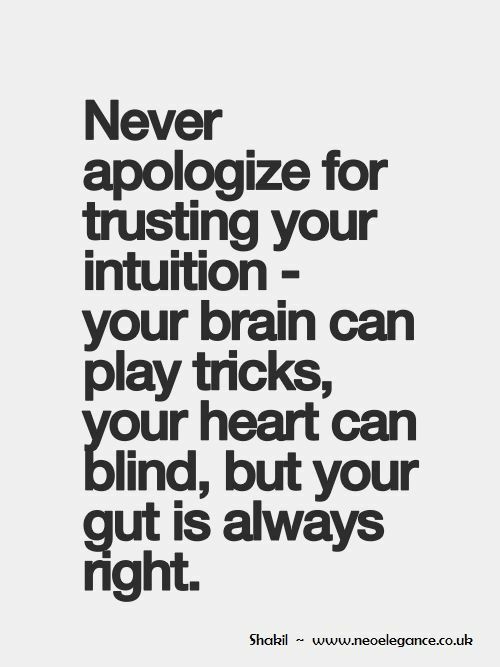 I’m choosing to listen to my gut. I’m not discarding my brain nor my heart. They will forever have a seat at the table. But at the end of the day, I will breathe in, trust myself, breathe out and decide.